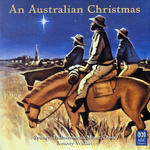 An Australian Christmas / Sydney Philharmonia Motet Choir ; Anthony Walker, conductor. Ring out, wild bells / music by Elliott Gyger ; words by Alfred, Lord Tennyson. Choral music : live recordings 1987-2004 / Elliott Gyger. Text from 'In Memorium' by Alfred, Lord Tennyson. 26 Nov 87: Old Darlington School, University of Sydney. Featuring Eric Gross, Pro Musica Choir.